Replace “stout” with “gose” or “gueuze”, and you can count me in. As beer aficionados probably already know, despite their sort of similar sounding names and sour dispositions, gose and gueuze are two different styles of beer with two different brewing traditions. But like the hazy acidic ales themselves, even some beer buffs are a bit cloudy on the details. As such, I’ve taken it upon myself to clear up the sometimes re-quoted, but not double checked, facts about these sour subjects. First things first: pronunciation. The word “Gose” comes to us from Germany and is pronounced “Go-Zah”, with emphasis on the “O” like the healthy breakfast beverage Mimosa. The style originated in the town of Goslar, which is located almost dead center in northern Germany. In the Fatherland, it’s fairly common to find a certain beer style (rather creatively) named after the city or town from which it originated as is the case with Berliner Weisse, Munich Dunkel, Dortmunder Export, Dusseldorf Altbier and even the refreshing summer beer Kölsch, named after the city of Köln, or in English, Cologne. Perhaps this is the reason some sources assert that gose got its name from the town of Goslar where it was first brewed, though it’s probably more accurate to say that both the town of Goslar and the beer gose derived their names from the river Gose which flows through the center of the town; the water from which is said to have been used in the original brewing of gose. Even The German Beer Institute makes the claim that “It is known that even Emperor Otto III, who ruled Germany between 983 and 1002, sang the Gose’s praises.” Perhaps this is why several other sources including Brew-Your-Own Magazine, All About Beer Magazine, West Coaster Magazine, Sori Brewing, and many others assert that gose is over 1,000 years old. * However, the earliest recorded document officially mentioning “gose” by name is the Goslar Council Regulations (Goslarer Ratsverordnungen) of 1470 AD, which nevertheless makes gose quite the historic beer. Prior to 1470, it may be that gose was referred to as “Goslar Beer”, or “cervisia Goslariensis” in Latin, which was first documented in writing in 1239. ¹ It was then that Duke Otto von Braunschweig encountered Goslar beer, a fact that is significantly more historically supported than the claim that Kaiser Otto III was singing gose’s praises in his lifetime. 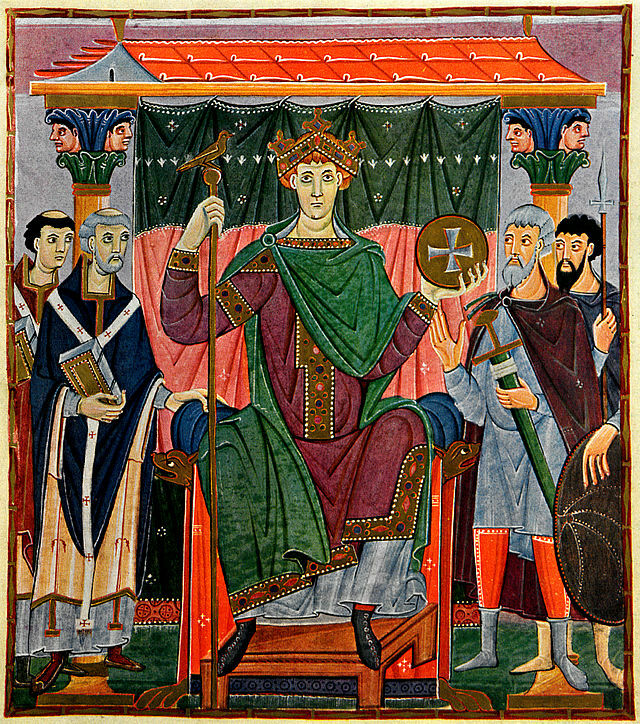 To make matters worse for our dear Kaiser, the earliest record of beer, any beer, ever being brewed in Goslar dates back to 1181 AD as documented in a cartulary (medieval manuscript) in the City Archives of Goslar, which puts the possibility of Otto III enjoying a sour pint of gose in 996 even further out of reach. ² Perhaps the final nail in the coffin is that according to Ulrich Albers of the Stadtarchiv in Goslar, there is absolutely no reference to the Kaiser being in Goslar at any time, let alone in 996. Although first brewed in Goslar, gose almost certainly owes its survival to Leipzig, a city about 115 miles to the east, where the beer became extremely popular after arriving on the scene in 1738 (it’s said that Duke Leopold of Anhalt-Dessau brought it to the city). However, as with high school, popularity doesn’t always last. After ceasing to be brewed and nearly becoming extinct first in 1945 and then in 1966, and then again in 1988, gose has seen a resurgence with at least three German breweries producing this die-hard brew.³ In addition, plenty of American brewers have come to this once ailing ales’ aid with both micro and macro breweries brewing their part to keep gose off the endangered spices list. Breweries breathing new life into the traditional sour are all too aware of gose’s brushes with death, and often make playful reference to it on their labels as with Sam Adams’ interpretation of the style called “Verloren” (meaning “lost” in German), and Freigeist’s “Geisterzug” (meaning “Ghost Train”). Gose, the Comeback Kid, has even gained the title of the official drink of Leipzig and the style has been further classified there as “Leipziger Gose”, which is reportedly more sour than the Goslar version. Yes, gose has the distinction of being one of the only, if not the only, traditional beers still brewed today that uses salt; in fact in some places in Leipzig, you can even select your desired salt level. As an ingredient, salt can be used to accentuate flavor and enhance mouthfeel , and in the case of gose, may have been used to emulate the water profile of the Gose River. Either way, is it really so strange that brewers, the liquid analogs of bakers, might have salt on the ingredient roster when salt is added to almost every type of baked good in existence? It also doesn’t hurt that salt has the added property of making people thirsty, and what better way to quench that thirst than with another gose! 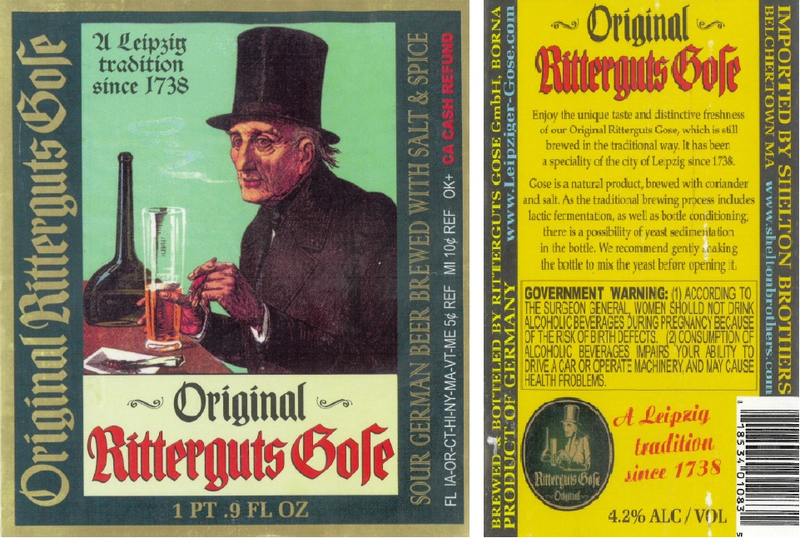 It should be noted that depending on the brewery, particularly Döllnitzer’s Ritterguts Gose brewed just south of Leipzig, German gose can be extremely sour, sometimes rivaling any sour beer on the market, even the lactic acid laced Berliner Weisse. This may have been in part due to the fact that during a gose revival in the 1980s, gose was being brewed by the Berliner-Weisse-Brauerei. And like the über-sour Berliner Weisse, gose is often served mixed with sweet raspberry or woodruff syrup, or even sacchariny schnapps, in order to sugar coat the tartness of this sour bomb. Though per a source from 1927, it was said that “Gose is a Leipzig speciality. It is similar to Berliner Weiße, but sourer and not to everyone’s taste. (Pour the bottle slowly. )” So it could be that gose was always on par with Berliner Weisse, at least as far as sourness is concerned. 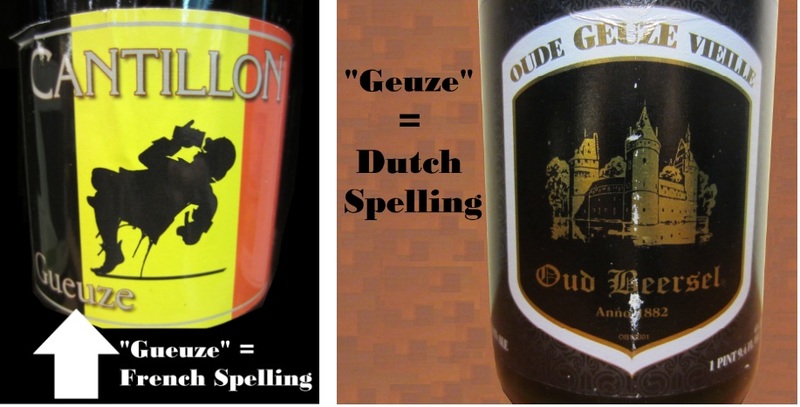 From Gose to Gueuze… or is it Geuze? 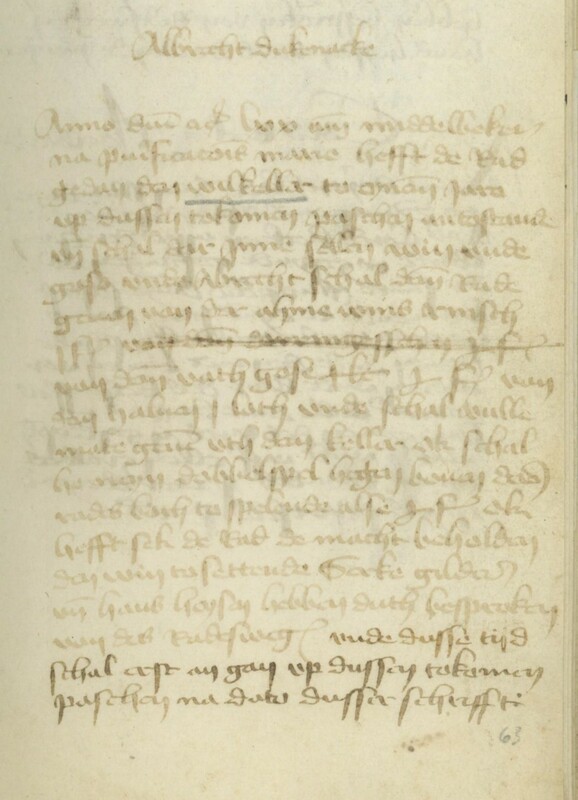 Pronunciation was the easy part… sort of. Now, the task of determining the actual origin of the word “gueuze” (or “geuze”) turns out to be slightly more challenging, and, like the original weekly-installment-style-release of Dickens’ classic novel, A Tale of Two Cities, one that will have to wait until next time. Like this blarticle? Well, thanks- you’re far too kind. 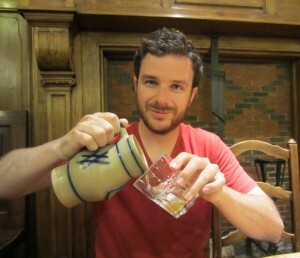 Hi, I’m Dan: Beer Editor for Beer Syndicate, Beer and Drinking Blogger, Gold Medal-Winning Homebrewer, Beer Reviewer, AHA Member, Beer Judge, Shameless Beer Promoter, and Beer Traveler. Add “Beer Historian” to the list? Sure- why not. Beer Syndicate Wants You… To Polish Your Keg! Great article! Just found it and couldn’t agree with you more on these styles!